"Once there was a village where the streets rang with song from morning till night...."
It made the village of La Paz so noisy that it was hard to hear, to sleep, to think. So, the villagers fired the mayor and voted in Don Pepe who promised the people peace and quiet. Don Pepe made new laws that grew bigger and bigger until any little noise became the enemy. Seven years later a little rooster wandered into La Paz and began to sing his song. Unfortunately for him, he sang his song under a mango tree near Don Pepe's window. The mayor insisted he be quiet and too away his mango tree. The rooster sang on. As time went on, the mayor took away the rooster's hen and chicks and his corn. But nothing could make the rooster stop singing. The mayor took away the rooster's sunshine and light. The rooster kept on. This powerful story is about the importance of speaking your truth to power. 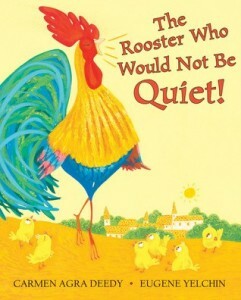 Bright and bold illustrations create an atmosphere of fun as the underlying message quietly waits to be heard. "La Paz is a happy, but noisy village. A little peace and quiet would make it just right. So the villagers elect the bossy Don Pepe as their mayor. Before long, singing of any kind is outlawed. Even the teakettle is afraid to whistle!